My son & I were at the supermarket & he was intrigued by Koka’s Purple Wheat Noodle, which was launched sometime back. I’m not a fan of instant noodles but I also found the colour fun & gave in to Jon’s request. Besides, it read, “The first & only instant noodles that is loaded with the benefits of age-defying Antioxidants”. I was immediately sold! When we opened up the package at home, we were surprised that there were no seasonings inside; unlike other instant noodles. Errrr………so what do we do now? Cook the noodles in boiling water for about 3 mins. Drained & drizzle olive oil to prevent noodles from sticking. Heat about 1 tbsp of olive oil & sauteed garlic till fragrant. Add noodles, parsley flakes & seasonings. Mix well. Add sliced sausages & let cheese melt. Dish onto serving plate. Meanwhile, defrost mussels. 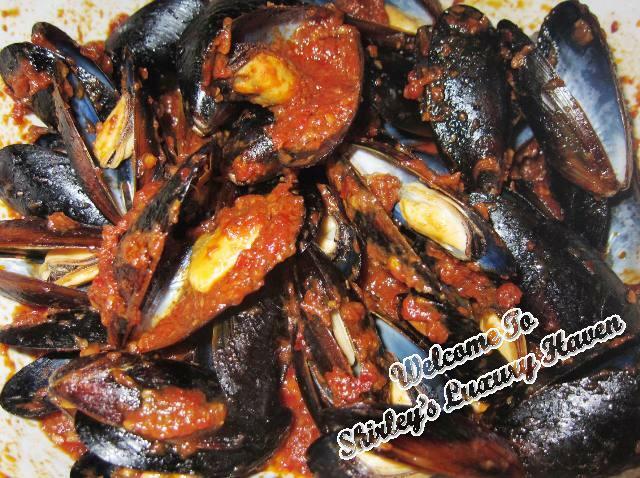 Mix with Arrabbiata sauce & microwave mussels on med-high for about 6mins. Serve hot together with your Instant Noodles! Koka Purple Wheat Noodle is especially good as a cold noodle / salad dish too, to go with your favourite seasoning or dressings. 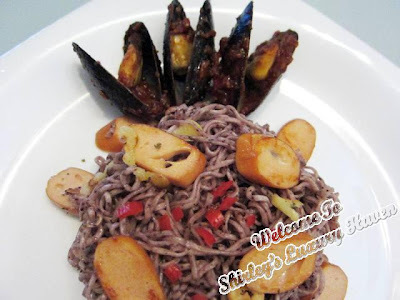 If you do come across these purple noodles, try it! Shirley, I don't I have seen Koka instant noodles here in KL. Maybe that is because I don't know about it. Now I will be more observant. You now made me curious to find out how it taste:D You made them look so delicious. Ken, I like Maggi too, only the Assam Laksa :) Thks for visiting! KF, hahaha! I take it as a compliment :) Thks! Anu, glad u like it too! 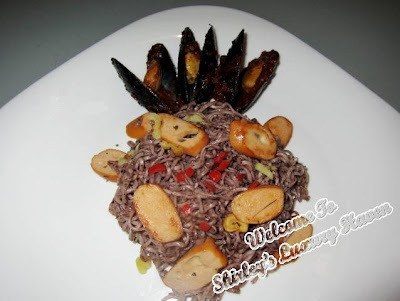 Thanks for liking Erecipe fan page, I also do like your blog and I scrolled on your recipe they are very interesting. Hope you will be one of our featured chef on our site. Peggy, thks so much for your lovely comments! The mussel looks goods added into the noodles. Everything now comes with colors and the green noodles made from spinach is also great in taste. I've seen the purple Koka noodles downstairs in my neighbourhood supermarket too!! Very nice colour, but I avoid instant noodles for my kids' sake, not because I don't like them LOL I didn't know it had no flavour pouch. I wonder now, is it non-fried too? In that case, it's actually quite healthy isn't it? You are really amazing! Like you, i never like instant noodle but then when it went under your hand, it's completely different and it looked really delicious! I've never had Koka instant noodles before. Surprising that they didn't have seasoning. You did a great job of livening up a plain old bowl of instant noodles. Loving the addition of mussels. Will have to look for these purple wheat noodles next time I'm shopping. Doris, this is instant noodles so no excuse for being lazy! Ha!